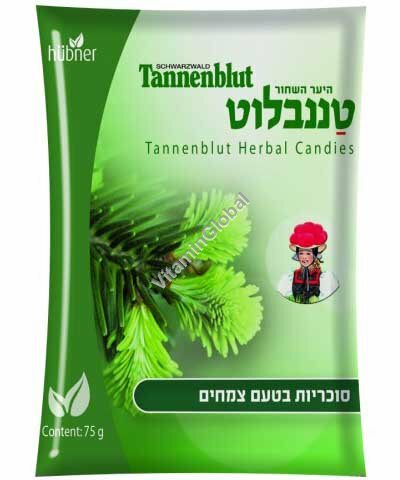 Tannenblut filled candies are pleasantly flavored and beneficial to the respiratory system. The coating and filling of these special lozenges contains carefully selected, delicious herb extracts. Ingredients: Sugar, Glucose, Wild Honey (9.5%), Water, Natural Flavor, Malt Extract Made Of Barley (1%) (Contains gluten), Ascorbic Acid (Vitamin C), Natural Menthol, Pectin, Natural Spruce Needle Flavor (0.05%), Star Anise Flavor (0.03%), Caramel Sugar Syrup, Fennel Oil, Peppermint Oil, Eucalypt Oil. Free from: lactose, milk protein, egg, soy.